Pam grew up as a “preacher’s kid.” Her father was a Presbyterian Minister. Pam accepted Christ as her Lord and Savior when she was 9 years old. Music has been an integral part of her life since starting piano at age 6. She began studying organ in high school from a music professor at Mary Baldwin College. She went to Radford College where she majored in music education with an emphasis in organ. Mrs. Osborne began playing the organ for church during her high school years. She graduated salutatorian of her high school class. During college, she played the organ every Sunday for the Presbyterian chapel that was located on the Radford campus. After college she served as organist for four churches in California, Texas and Virginia. 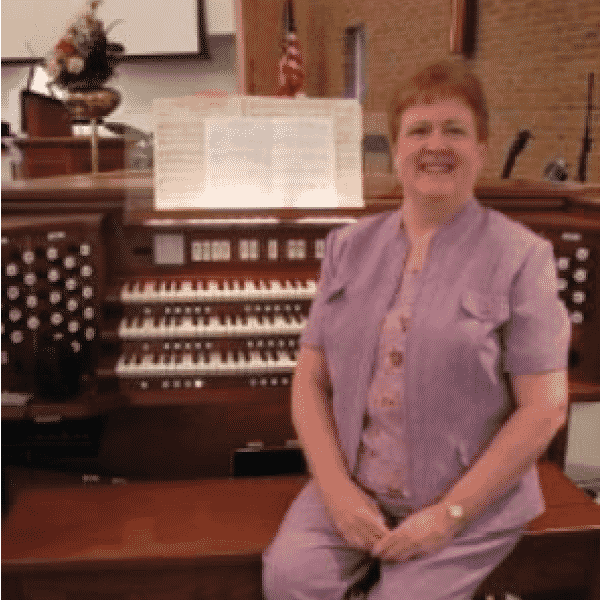 She became the first organist at Faith Church, which was founded in 1987 and she is a charter member. Besides her position as organist at Faith, Pam teaches piano lessons in her home. She enjoys having her son Jeff and daughter Janet close to her home. Pam and her husband Alex are competitive tennis players. Pam enjoys playing for the worship service every Sunday, accompanying the choir, the praise team, and the talented musicians within our church. The blend of music is refreshing, from classical masterpieces that convey a deep reverence to our great God, to contemporary music that moves the soul. Praise God from whom all blessings flow.